Why Choose the Easy-Lift Wallbed Mechanism™? The kind of wall bed mechanism that you choose for your project does matter. You get more than a small box of parts and hard to understand instructions. The Easy-Lift Wallbed Mechanism.™ also comes with the complete Bed Pedestal (13 Wooden Parts) all machined to the correct specifications. This saves you at least one day of work by not having to read through the instructions, cut all the parts, edge, sand, and finish them, drill all the holes, do special routing and machining or buy special tools to do the project. 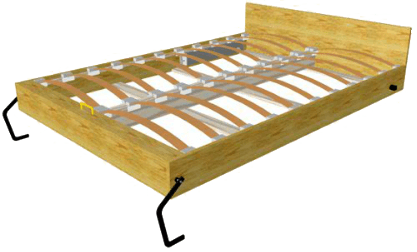 It also comes with a very high-quality Euro-Slat Box Spring and our exclusive Automatic Leg Assembly. All the hard work is done for you. You add the Bed Face and build the outer Cabinet and you are good to go. The Easy-Lift Wallbed Mechanism™ is the strongest and most versatile system on the market today. Click each keyword and see all the features and benefits the Easy-Lift brings you. The Easy-Lift Wallbed Mechanism™—not your ordinary wallbed hardware. What is the Easy-Lift Wall Bed Mechanism™?